Have you ever wanted to combine a round of mini golf with a bar crawl? Well, now is your chance! 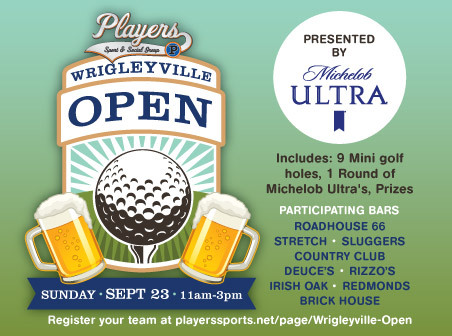 Join Players Sport & Social Group as we golf our way through Wrigleyville! We have 9 participating bars, which will each have their own miniature golf hole set up along with great specials on Michelob ULTRA. Teams of four must complete all 9 holes to be eligible for prizes provided by our partners at Michelob ULTRA! Registration is FREE and open to anyone over 21. (Teams consist of 4 players, 1 registration is good for 4 people)! 11:00am - Check-in opens at Rizzo's (3658 N Clark st 60613). 11:15am - Teams tee off. 2:30pm - All scorecards must be completed and returned to Player's Sport & Social Staff at Rizzo's. 1. All teams need to provide their own putter. 2. All rulings by event staff are final. 4. All balls hit out of bounds result in a 1 stroke penalty. 5. Official judges score all scorecards at each hole. 6. 5 stroke maximum per hole. 7. All scorecards must be turned into the official judges at the last hole. - Each team members score per hole is added up and the lowest overall team score wins. - In case of a tie, a random drawing will take place.